A medium sized bird of prey, weighing in at around 780-930 gr and a wingspan close to 150 cm. 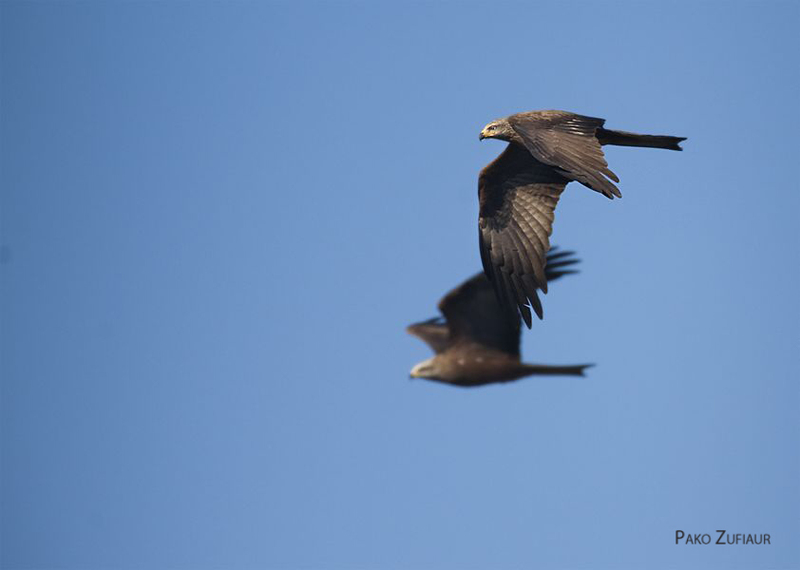 In flight it has a slender silhouette, with its long wings and forked tail, characteristic of the genus Milvus. Its plumage is a consistent brown, darker dorsally and slightly lighter ventrally, with light panels beneath the wings. Its head and neck has a greyish colouration. 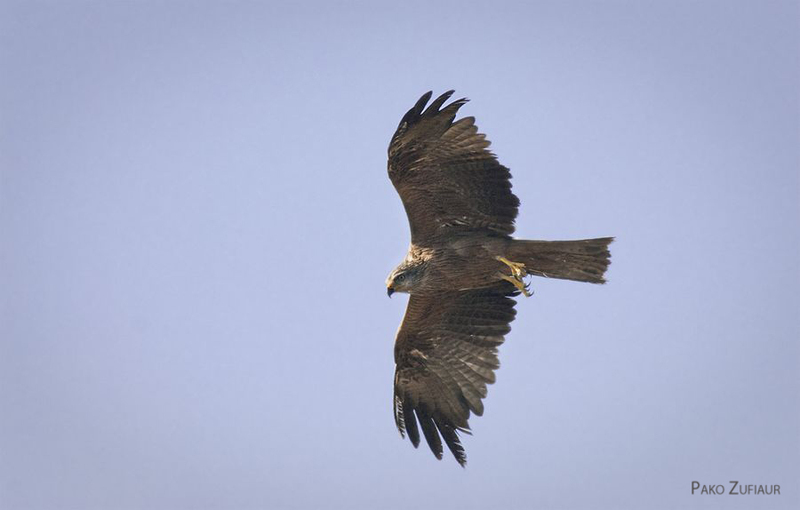 Juveniles present a darker head, browner tones and a more conspicuous distal part of the wing. Habitat: They inhabit a wide variety of environments, although they select areas without too many trees, bearing areas with moderate levels of human activity, easily seeing them nest close to rubbish dumps and farms. They’re also abundant close to rivers and reservoirs, especially in meadows along the middle and low sections, where densities are higher. Less frequent in mountainous regions although they can be present on localized high densities. Nutrition: Species adapted to finding and hunting down smalls vertebrates and invertebrates, as well as scavenging. Common in livestock farming areas, they’re frequently seen near farms and by the roadside in search of leftovers and roadkill. They concentrate in agricultural areas especially during the harvest when small vertebrates and insects are more exposed. They’re also very common in rubbish dumps and dunghills. Daily trophic needs: Estimated at 128 g/day for an adult individual..
Reproduction: Trans-Saharan migrants, they reach their breeding areas at the beginning of March and abandon them at the end of July and August. The Strait of Gibraltar presents the maximum migration in March (prenuptial migration) and the first fortnight of August (postnuptial migration) surpassing the 100.000 individuals. They build their nests in trees, sometimes forming breeding colonies with high densities. The female lays between 3-4 eggs which she incubates for a month. The chicks develop during 40-42 days. It is a very social species, which tends to concentrate in areas close to abundant food such as farms, rubbish dumps, etc., where they often form large roosts. Polytypic species with seven recognized subspecies. One of the birds of prey with the most widespread global distribution present in wide areas throughout Europe, Asia, Africa and Oceania. In Europe it’s the subspecies M. m. migranswhich nests; the populations are seasonal wintering in the sub-Saharan Africa where they coexist with the subspecies M. m. parasitus. The largest populations in Europe are found in Russia, Spain, France and Germany. In Spain they are distributed throughout the north and west of the Peninsula, in the valleys of the major rivers in Extremadura, Castile & Leon, Aragon and foothills of the Pyrenees, Cantabrian Range and central System. The global population is estimated at 1.000.000-6.000.000 pairs, although this estimate has to be revalidated with more precision. In Europe the estimates are around 64.000-100.000 pairs, of which 9.500-11.000 are in Spain. The most recent data for Castile and Leon, from 2010 indicate that a total of 4.170-4.400 pairs reside in the region. 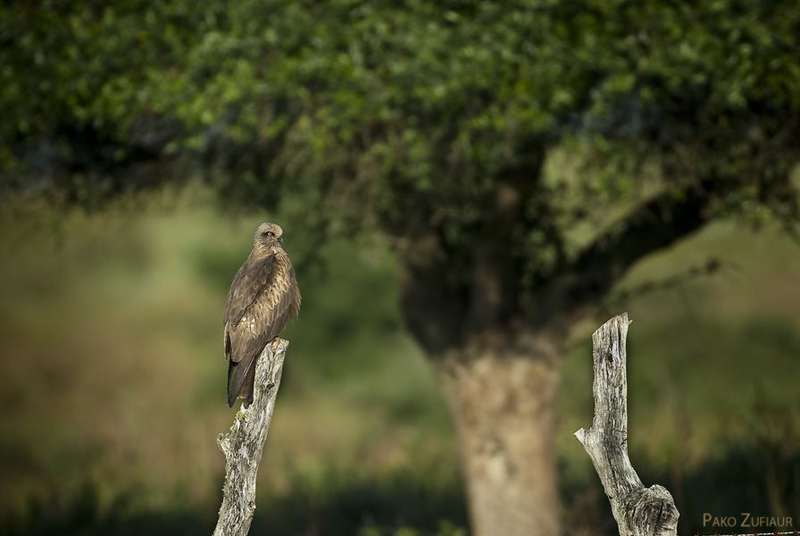 Although it could most possibly be the most common bird of prey in the world, the global population has decreased due to poisoning, hunting, the use of pesticides and water contamination. At European scale the number of reproductive individuals is considered to be sharply declining. In Spain the species is too considered in decline. The most important threats are the illegal use of poisons, to which the species is particularly vulnerable, as well as deaths associated with power lines and hunting. Some populations have been affected by the loss of their traditional food sources, such as dunghills and rubbish dumps, as well as by contamination from rodenticides and other plant protection products.